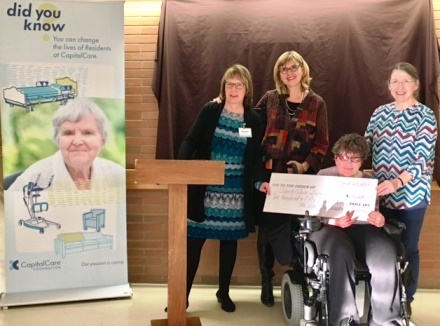 In February CapitalCare Foundation received a generous quarter of a million dollar gift to help residents at CapitalCare’s north Edmonton centre. Residents at Dickinsfield are a mix of seniors with dementia and physical disabilities, as well as young adults in long term care. Many years ago one of those young adults was Leslie. After Leslie’s passing, her mother, Josephine kept the centre in kind regard. In 2016 Josephine passed away and left a portion of her estate to the centre. Josephine was an active member of the Edmonton art community so it is fitting that her portrait is now on display at Dickinsfield to commemorate her gift and Leslie’s time at Dickinsfield. The donation has been received at Dickinsfield with such enthusiastic gratitude. The centre desperately needs overhead lifts to assist residents in and out of bed. With 275 beds in total and only 27 lifts in place, the donation from the estate will provide 30 more lifts, bringing the number needed down to 160. These lifts provide full accessibility; helping to lighten the load and prevent back injuries for staff, as well as alleviate discomfort and hardship for residents. 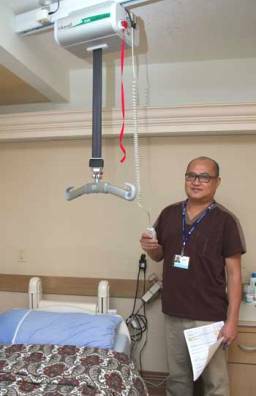 Fundraising for this type of equipment is totally reliant on support from our community. Josephine's generosity in memory of Leslie's stay at Dickinsfield cannot easily be measured. Its impact is lasting and will leave smiles on the faces of residents and staff for many years to come. For more information about the Lift Project at Dickinsfield or any of CapitalCare’s nine centres, please contact the Foundation office at ccfoundation@capitalcare.net or call Sherry Schaefer 780.448.2430.